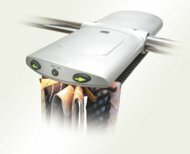 Electronic Rotating Tie Rack with Ionizer (tr-200) [ElectRotatingTieRack w/Ion(tr200] - $39.95 : NewDaVincis.com!, Great Innovative Products, Gadgets and more. Organize your tie collection with easy access to 70 ties in just 5" of space! Built in Negative Ionizer removes odors & bacteria, keeps your closet & ties smelling fresh & clean.
? Measures: 15.5" x 5" x 3"